PHILADELPHIA - The expectation for a Dan Hurley-coached UConn men’s basketball team varies based on your view of the former Rhode Island, Wagner and St. Benedict’s Prep leader. For Cincinnati coach Mick Cronin, who matched up with Hurley’s Rams, he believes the Huskies’ defense will be the thing that changes the most in the upcoming season. “They’re going to be fundamentally sound and play hard. They play to win,” Cronin said during the American Athletic Conference’s Media Day. “He’s got an interesting job ahead of him because they had lost their defensive mindset. And that in spite of having a defensive-minded coach in Kevin (Ollie). That obviously wasn’t the case in Ollie’s final season at the helm of the Huskies. UConn went 14-18 a year ago, including 7-11 in American Conference play. The Huskies allowed opponents to shoot 43.3 percent from the field. According to two experts, UConn was either 243 or 246, out of 351 teams, in defensive efficiency last season. Cincinnati, depending on your calculations, was either No. 1 or No. 2. UConn was picked to finish fifth in the preseason coaches’ poll that was released Monday. That’s not a number that Hurley is particularly concerned with, though he admits he’s aiming for better. “If Jalen Adams shows up as one of the best guards in the country, if Alterique Gilbert’s able to knock all that rust off, if Tarin (Smith) and Christian Vital and Brendan Adams are able to form one of the best guard groups…we may be able to be better than that,” Hurley said. And Hurley agrees with Cronin that most of the changes have to come on defense. And the Husky players are eager to get their minds right. Even the new Huskies believe the incumbent players’ overriding desire to change their ways is palpable. Hurley, much as he did last week before the Huskies’ First Night festivities, continued to praise the development of sophomore forward Sid Wilson. “The last 10 days or two weeks, that young man has turned it up,” Hurley said of the 6-foot-7 New York native who sat out last season after transferring to UConn following a brief stay at St. John’s. 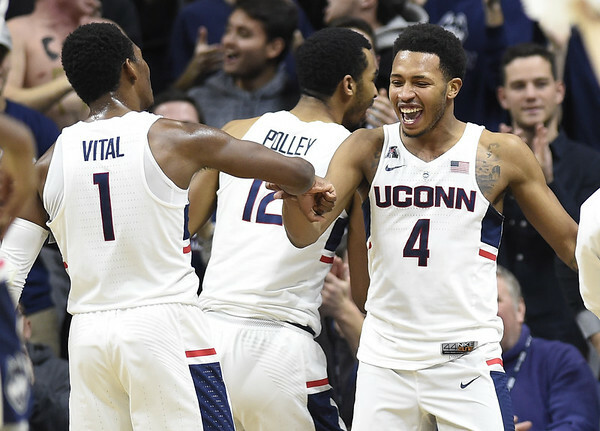 Hurley admitted that upon his arrival at UConn he had to deal with several “issues” with Wilson but that things have turned around considerably in recent weeks. His team has already secured the commitment of two guards in the Class of 2019 and could soon see a frontcourt player join the fold. Overall, Hurley says he has been pleased with the Huskies’ recruiting efforts in this class. UConn welcomed a pair of big men to First Night, including 6-foot-9 Putnam Science standout Akok Akok. A report over the weekend that Akok has already committed to the Huskies is apparently erroneous but Hurley’s team remains squarely in the hunt for his services as well as those of Qudus Wahab, another Friday visitor. Guards Jalen Gaffney and James Bouknight have already given Hurley’s Huskies a verbal pledge. Posted in Newington Town Crier, UConn on Tuesday, 16 October 2018 19:13. Updated: Tuesday, 16 October 2018 19:15.